There is nothing quite like the feeling of a nice, warm massage after a particularly long hard day at work, and if you’re going to get some massaging done in the comfort of your home, then the £14.99 Egg Massager makes perfect sense. 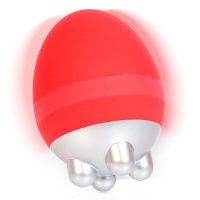 This unique Egg Massager will not be able to change colors like a lava lamp, but it will still provide you with some much needed relief. Considering the shape and size of this device, it is a snap to control and comfortable to hold for an instant massage session. Comprising of a couple of interchangable massage heads that deliver single point or multi point massage, there is also a heat function in the single point massager which will further increase blood circulation. Of course, I would advise you to get ready your fair share of rechargeable AAA batteries – it requires a trio of these to power up the Heated Egg Massager, and if you’re going to spend plenty of time with it, why not make sure you be as green as possible?